As part of the University of Rochester, CUES has access to research conducted throughout our community of scholars. We provide this portal to gather and share their work that relates to education reform and best practices in urban education. St. George, C. (2019, March 15). University of Rochester Reading Program Showing Promise. Democrat & Chronicle. With feelings of urgency to improve literacy learning in the Rochester City School District (RCSD), Project READ, an intervention program partnering the U of R’s Warner School of Education and RCSD was started at a local elementary school and recently expanded to East High’s Lower School. Warner graduate students working toward certification in literacy work directly with at-risk 1st and 6th graders. Results show significantly improved reading levels, increased engagement in school, more enthusiasm towards reading, better attendance and students’ improved confidence. 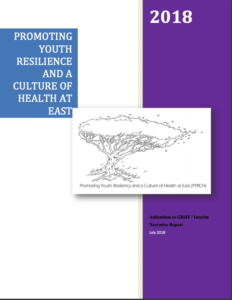 The PYRCH project is a collaborative effort between University of Rochester Clinicians and East Lower and Upper school Faculty and Administration to increase youth resiliency, increase screening for sexually transmitted infections, and to increase consumption of a nutritious breakfast for scholars. The three year project is being supported through funding from the Greater Rochester Health Foundation and the University of Rochester. As of the end of the 2017-2018 school year, the PYRCH project had met or exceeded outcome goals in all project domains. This report explores those outcomes and the processes used to achieve improvements for scholars and staff at East. Meuwissen, K. W. (2017). 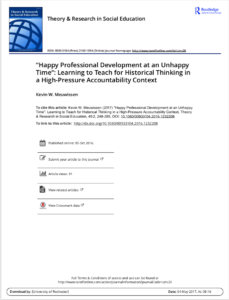 “Happy professional development at an unhappy time”: Learning to teach for historical thinking in a high-pressure accountability context. Theory & Research in Social Education, 45(2), 248-285. In this qualitative case study, two urban social studies educators – one middle-level, one secondary – worked under different sets of conditions in their efforts to enact new strategies for teaching historical investigation, interpretation, and argumentation in their classrooms. These sets of conditions included: (1) a professional development program designed to help teachers develop aims associated with and shift their practices toward more powerful historical reasoning, discussion, and writing; and (2) school and professional accountability conditions that reinforced the need for teachers to raise students’ scores on standardized tests in order to demonstrate effectiveness and avoid sanction. What made these conditions uniquely challenging is that the conception of “knowing history” and demonstrating that knowledge on standardized tests did not align well with the conception of “doing history” and participating in historical investigations in the professional development program, leaving program leaders and participating teachers to navigate different (and sometimes oppositional) contextual factors in their efforts to strengthen their teaching. Finnigan, K., & Daly, A. J. (2017). 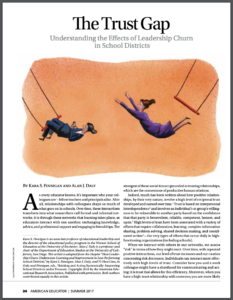 The trust gap: Understanding the effects of leadership churn in school districts. American Educator, 24-43. As every educator knows, it’s important who your colleagues are—fellow teachers and principals alike. After all, relationships with colleagues shape so much of what goes on in schools. Over time, these interactions transform into what researchers call formal and informal networks; it is through these networks that learning takes place, as educators interact with one another, exchanging knowledge, advice, and professional support and engaging in friendships. The strongest of those social ties are grounded in trusting relationships, which are the cornerstone of productive human relations.